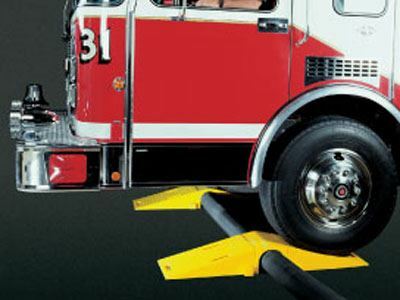 Diamondback Modular Cable and Hose Bridge Systems provide protection for valuable cable and hose lines while ensuring a method of safe passage for vehicles. They replace wooden and metal fabricated ramps. High density, all weather urethane construction protects from damage by physical pressure and reduces cable and hose maintenance and replacement costs. Diamondback Modular Bridge Systems can be used to protect lines up to 6 inch diameter. The lightweight, modular design of interlocking 16 inch wide sections provides multi-length flexibility. Diamondback Cable and Hose Bridge Systems are intended for temporary installations only.